I had seen Escape from New York before, but it was The Thing that converted me into a John Carpenter fan. It started in December 1982 during a midnight preview in the Passage Theather, Hamburg. The hall was filled with a jolly audience. Nobody knew what was going to happen in the next 109 minutes. In those times, films still could surprise you. The Universal Studios really managed it to keep the monster a big secret. In todayís internet-age, this is a nearly impossible task. The grotesque creatures of a perverted fantasy hit the spectators like a hammer. I ground my fingers into the armchair, when Norris transformed into the monster, his torso ripped open and a line of sharkteeth bit off the arms of poor Dr. Copper. You really could see, how his stumps were floundering when he fell screaming to the ground. Out of the open stomach jumped a creature from hell with tentacles, slime and giant teethes. And this wasn't everything! Screaming, his head veered from the neck, dragging a trail of viscous, green slime behind. Spiderlegs were breaking out of the head and "head over heels" this monstrosity was crawling away. It was dead-silence in the hall. You could have heard a pin drop. After the show everybody left sweaty and in silence. I was completely thrilled! Of course, it would be totally wrong reducing The Thing only on these shock-sequences. The film, respectively John carpenter's work in general is more complex than splatter scenes. But it were those effects, that blew my mind outta the armchair when I was19 years young. A few days later, after I've seen The Thing, I joined the John Carpenter/ Kurt Russell Fan Club. I had discovered the ad in an orderlist for collectibles. The fanclub was founded in July '82 with a strongpoint on EFNY. It lasted a while until the first fanzine TRACER came out in summer'83. The content was quite good, but the layout was dilettante (even for that time) and the photocopies lousy. In October '83 I met Sabine Thaler, the publisher of the fanzine during the Jedi-Con in Frankfurt (Germany's first, big Star Wars Convention!). She told me that the 2nd issue will already be the last number and offered me the "leadership" of the club. Because I always wanted to publish my own 'zine and the comic fanzine, I had worked for, had just been canceled, I took the offer. Originally I wanted to turn the club into something big, but I refrained from that thought pretty fast. The effort and cost would have been immense. Time and money were valuable resources, I had only very little of at that time. During the preparations of my first fanzine, I was also fighting to master my Abitur (final exam). But thanks to the commitment of the members, TRACER #3 could be released relative fast in April '84. The issue was CHRISTNE and SILKWOOD orientated, which just had started in the theaters. The circumstance that I smuggled myself into the press preview of CHRISTINE helped me getting the issue done. A school-friend had seen the red and white Plymouth Fury Hardtop Model 1958 in front of a garage and called me. I raced to the place to see the unbelievable myself... and there she was! In awe I surrounded the car and gently touched the cold metal. A view in the inside was disillusioned and revealed a pretty shabby condition. After my mind started to function again, I came to the conclusion that Christine's presence can only mean one thing - a press preview! This evening I was standing in front of the Streit's, the theater where most of the press presentations took place at that time. The Plymouth was parking in front of the foyer and nobody checked the invitations. In general this is only done for "big premieres". After the show I bullied my way through the people to get a press kit. It was a blast! In triumph I returned home. It was wise to get some sleep, because the next morning I had to face my final exam in the 3rd exam course. I took over the club during a pretty difficult time of my life. In school I had to fight for every point passing my Abitur (final exam). All that learning for nothing pissed me off. I stand away from the plans I had for years studying art or graphic design. An established cartoonist scene like today didn't existed. We were all single combatants. Disillusioned and not quite knowing what to do with my life, I found myself in the bizarre men's world of the army. This wasn't so great either. My ancient cast-iron, black Continental typewriter broke. Getting forward with the work on issue #4 I typed after duty in the lecture-room of the staff recruits during boot camp. The pages of the TRACERS were mainly filled with translations of American magazines like Starlog, Fangoria or Cinefantastique, as well as media reports and PR-material. I've to stress out again that this was before the computer- and internet age. Video had just been established as a new media. Cable TV didn't exist. American special interest magazines were my only source of information that I had to obtain expensive as imports. Most German SF-magazines were short-lived and the fandom just started to get organize. Trying not too much sound like a bigmouth, but we were the pioneers of toadyís merchandising-overkill! The club was active in a time, when John Carpenter was degenerating in the public from cult-director to fallen wonderboy, because of financial flops and sadly also because of some creative disappointments. THE THING was brilliant, but a giant flop. CHRISTINE was more of a makeshift, after his FIRESTARTERproject had failed. STARMAN was a "nice" but a very "untypical" John Carpenter movie and BIG TROUBLE IN LITTLE CHINA is in all aspects, financial and creative a failure. Under these circumstances it's difficult keeping a fan club alive. In May '87 with #8 I put the fan club at rest and quit publishing the TRACER. The JC/KR FC didn't revolutionized the fandom, but among the ~20 members a few were very talented and committed, despite everyoneís inexperience and deficiency. The TRACER was a good fanzine I stand for, even after 15 years. 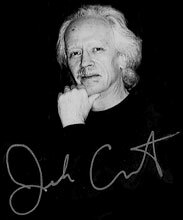 Or visit the official John Carpenter site. There you can discover a lot of information, film- & soundclips, etc. For a later time, I might add my thoughts and poit of view about John Carpenter, but not right now. I'm always interested in buying John Carpenter stuff, especially US-onesheets, lobbycards & PR-material.